There is growing interest in low-cost, efficient materials for the removal of organic contaminants in municipal and industrial effluents. 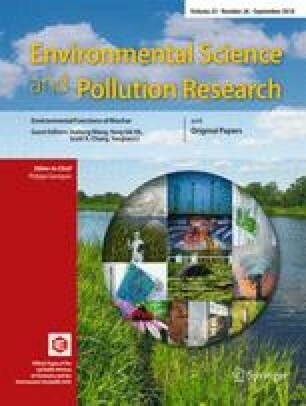 In this study, the efficiency of biochar and activated biochar, as promising adsorbents for phenol removal, was investigated at high (up to 1500 mg L−1) and low concentrations (0.54 mg L−1) in synthetic and real effluents (from wood-residue deposits in Québec), respectively. The performance of both materials was then evaluated in batch adsorption experiments, which were conducted using a low solid/liquid ratio (0.1 g:100 mL) at different phenol concentrations (C0 = 5–1500 mg L−1), and at 20 °C. Activated biochars presented higher phenol adsorption capacity compared to biochars due to their improved textural properties, higher micropore volume, and proportion of oxygenated carbonyl groups connected to their surface. The sorption equilibrium was reached within less than 4 h for all of materials, while the Langmuir model best described their sorption process. The maximum sorption capacity of activated biochars for phenol was found to be twofold relative to biochars (303 vs. 159 mg g−1). Results also showed that activated biochars were more effective than biochars in removing low phenol concentrations in real effluents. In addition, 95% of phenol removal was attained within 96 h (although 85% was removed after 4 h), thus reaching below the maximum authorized concentration allowed by Québec’s discharge criteria (0.05 mg L−1). These results show that activated biochars made from wood residues are promising potential adsorbent materials for the efficient treatment of phenol in synthetic and real effluents. The authors thank Miss Anne-Marie Marleau Claveau, Miss Maéva Giasson, Mr. Gilles Villeneuve, Mr. Mamadou Dia, and Mr. Nicolas Bergeron for their assistance with experiments, analysis and testing in the laboratory. This research was funded by the Québec’s Ministry of Economy, Science and Innovation (Ministère de l’Économie, de la Science et de l’Innovation du Québec), the Natural Sciences and Engineering Research Council of Canada (NSERC), the Canada Research Chair Program, the College of Abitibi-Témiscamingue, and the Technology Centre for Industrial Waste (Centre Technologique des Résidus Industriels) through its partner on this project, Airex Energy. The first author, Dr. Flavia Lega Braghiroli, also sincerely acknowledges NSERC financial support via a Banting Postdoctoral Fellowship (2017–2019).